The German first tier league has been dominated by the Bavarian powerhouse, Bayern Munich, for the past 4 years. Their success is envied by several high profile clubs in other leagues. 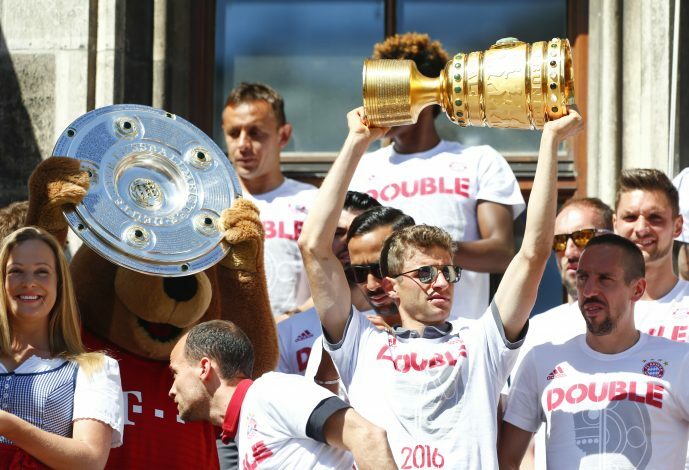 Bayern have managed to bag the last four Bundesliga titles – not an easy task by any means. The German giants have won a total of 10 Bundesliga titles since the 2000-01 season and with the imminent arrival of Borussia Dortmund star, Mats Hummels, it gives yet another indication of the potential damage that the Munich club can inflict. An incredible stat that proves Bayern Munich’s dominance in the German domestic league, revealed by BT Sport, claimed that even if Bayern Munich were to concede every shot they face this season, they would still be top of the league, thereby deeming world renowned shot stopper – Manuel Neuer – unnecessary. In fact, even Germany’s FIFA World Cup winning side had over half their players picked from the Bavarian side, with the World Cup winning goal scored by a Bayern Munich player. The Bavarian dominance raises many questions on whether it is good or bad for the Bundesliga in general. The question is whether Bayern Munich have turned a traditionally competitive league into a boring and predictable spectacle. Bayer Leverkusen sporting director Rudi Voller has been one of the many people to express his concern. “The danger is very real that it will be boring at the top,” Voller told the BBC earlier this year. “This season we have been close in terms of points, but Bayern’s quality is not just in the starting 11 but also in the 11 after that. It is so high,” Voller added. Current Bayern Munich boss, Pep Guardiola, is set to leave the club and travel to Manchester – where he will take charge of the mega-rich Manchester City. Taking over the reins in Germany will be former Real Madrid coach, Carlo Ancelotti, and the transition definitely seems one that will occur without any glitches. “Economically they are light years ahead of us,” he told Welt am Sonntag. “Certainly because of their extraordinary work in the last decades. When you look at the revenues, we fight – whether you’re Leverkusen, Wolfsburg or Dortmund – not with the same weapons. “Bayern are well ahead of the rest of the league in all areas. And in the future it will get more difficult for all other clubs to get to them. “Their stadium is paid off, they can bring in revenue and sponsorship like no other club in Germany. The Bavarians have constantly asserted their dominance in the German leagues, in the way they have won their titles and conducted transfers, their monopoly has persuaded star players (from their rival club) – Robert Lewandowski and Mario Götze – to join their squad after they opted to leave Borussia Dortmund. Bayern have also managed to attract several high profile names to join their ranks – the new signings Mats Hummels and Renato Sanches are sure to water the mouth of Carlo Ancelotti. The incomers will join an already star studded squad that includes players like Phillip Lahm, Manuel Neuer, Arjen Robben, Frank Ribery, and several others. Their tactics have always been tinkered and altered with as the managers come and go. The current boss, Pep Guardiola, has opted for his familiar tiki taka style of play. They prefer to maintain high levels of possession and attack with quick and abrupt runs from their attackers. Their midfielders have almost always played a major role in the success of the club. Bayern primarily play with a lone striker up front, with a second striker behind, to assist – meaning that the ball is constantly in play in midfield. It has always been their midfielders and wingers who have pulled through them in tough times and helped them win their many titles. Arjen Robben scored the winner in the 2013 Champions League final against their rivals Borussia Dortmund, Javi Martinez scored the crucial goal in the UEFA Super Cup that followed the year after, which took them to extra time and go on to win the cup. The incoming manager will definitely be under pressure for silverware and league dominance as the Bayern fans have become accustomed to this way of life. Bayern have always been the dominant name in home soil, but not as much on the European stage. Carlo Ancelotti is no stranger to the Champions League, having won the title 5 times as a player and manager. He certainly knows his way around the competition and is definitely the right man to push Bayern towards European success. Carlo may be the only man at the moment who is able to win two successive Champions League titles – a feat that has never been achieved before. His managerial skills and tactics are ahead of many of his opponents, with his quick and aggressive style of play. The Bayern fans will be looking forward to attractive football as well as total dominance. Money is never an issue with a club of this caliber – Bayern are not afraid to spend their bucks. Mario Götze became the most expensive German player in history after Bayern paid a whopping $45 million (transfer record later surpassed by Mesut Ozil). All in all, Bayern Munich are definitely a club not to be messed with, their financial powers and league dominance are envied by many. They have conquered Germany and have achieved what most clubs can only dream of. Carlo Ancelotti should be the cherry at the top of a magnificent squad. It’s only a matter of time before Bayern Munich’s domestic dominance spills onto the European stage.